Today we made the difficult decision that Diana's quality of life had deteriorated to the point where it was time to let her go. She was still eating but not enough to keep her weight. Her usual weight varied between 30 and 34 pounds, and she was down to 22 pounds. She had only one eye, but her eyesight in the eye was very poor. She was deaf, with severe arthritis, and failing kidney function. She'd take her medications for arthritis and kidney function only concealed in a piece of hot dog, and she was refusing the hot dog, so she was no longer getting relief from arthritis pain from the anti-inflammatory. Our kind veterinarian, Dr Scott, at Ridgefield Animal Hospital agreed we were not making the wrong decision, that Diana had only a short while to live, and it was unlikely that she would have good days, along with bad days, as had been the case a few weeks ago. 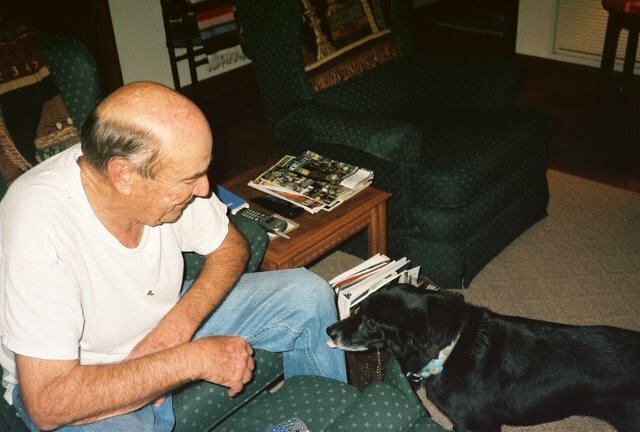 Diana was with us for 17½ years, a good long run for a dog friend, and we are thankful for all the years together. She was my companion on my walks until a couple of months ago, and I will very much miss our walkies together, but I have been missing her already. 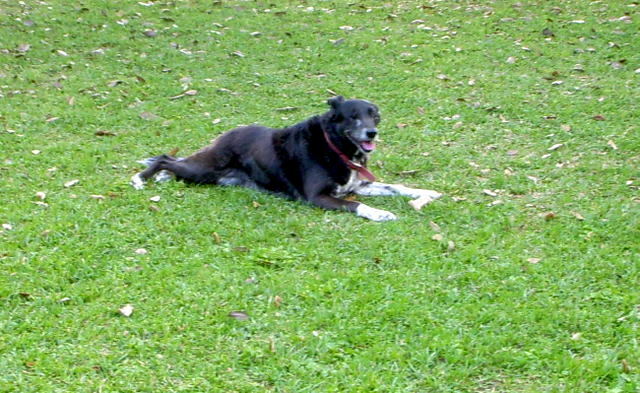 We are watching our dog Diana, who is 17 years old, deteriorate slowly. It's painful and depressing to see our once lively companion in such a sad way. She sleeps most of the time, but she still eats, drinks, and potties outside. She's losing weight because she eats much less than when she was healthier. Diana is deaf, has only one eye, and is nearly blind in the one. She has severe arthritis, but we give her anti-inflammatory medication every day, and she doesn't seem to be in pain. She's also on medication for failing kidney function. Our benchmarks are if she stops eating, or can't get up, or can't walk, then it's time. Also, the weight loss is a concern. Most likely, we will pay a visit next week to one of our wonderful and compassionate veterinarians for an opinion about her weight. Diana is in love with Tom at the moment. On the days when he works at the boat museum, she is obviously depressed, doesn't eat, and sleeps most of the day until he comes home in the late afternoon. On the days he's home, she eats better and follows him around wherever he goes until she decides it's time for a nap. Tom and I are both at peace with the decision, though we know there will be sad times ahead. We will spread her ashes in our yard and garden, which has become a virtual pet cemetery for our dog, Rusty, and the several cats who have shared our lives over the years, but, this time, Tom wanted to be spared the burial. I miss my walks with Diana. She still gets excited when she sees or hears or smells the leash, but she goes only a short way down the street now, and sometimes not even that far, sometimes only to the end of the driveway. That was our time, and that is gone. I think she functions more by smell now, since the other two senses are pretty much gone. The time is much more difficult than I had imagined. 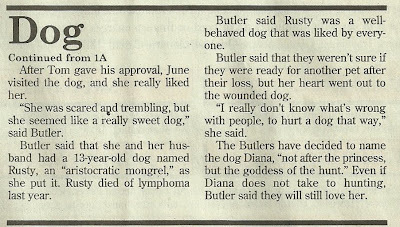 Rusty, who came before Diana, had lymphoma, and his decline was much faster, but I suppose one should not expect to be cheerful during a death watch. I find I'm grieving for her before she is gone. Grief will have its way, and I can do nothing else but go with it and love her as long as she is with us. So. 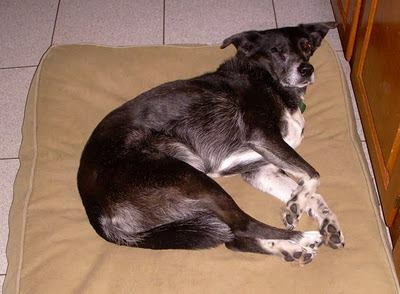 With help from an internet search, we have a better solution for our sometimes incontinent 16 year old Diana and wet doggie beds. We wash the covers of her beds in the washing machine, but the mattresses must be washed by hand and hung out to dry, which becomes a problem in rainy weather. I searched online for a waterproof cover for Diana's mattresses for her three beds, but I could not find the right size, except for one item which received rather poor reviews. An online source suggested large size trash bags as a temporary solution, but I don't see why the trash bag solution should be only temporary. Since Diana's beds are large, the 39 gallon size bags fit perfectly with just a bit of overlap, enough to seal with mailing tape. Aside from frequent washing of the covers, providing a clean bed for Diana has become much easier. Diana loves her beds. The three are alike, and she luxuriates in them. Before we found this style, she tore to pieces every bed we bought. Diana is still looking good at her advanced age. She's a little slow to rise from a reclining position, but once she gets going, she's still fast. She quickens my pace on our walks. The azaleas are just beginning to bloom. 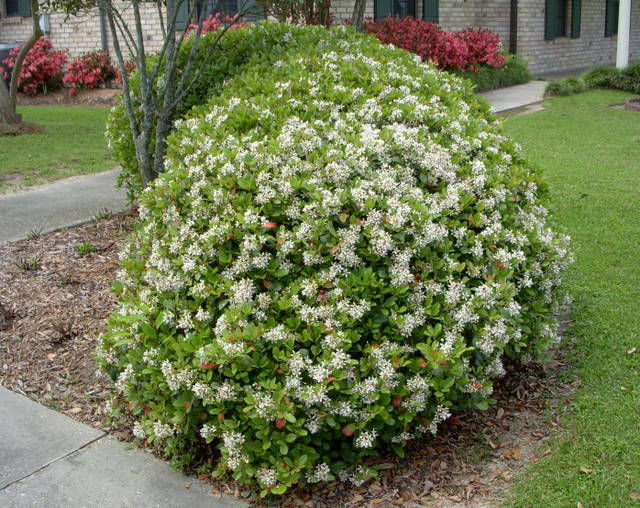 The bush will look gorgeous once it's covered with flowers. The small bush in the background looks as though it might not make it in the long term, but it's still blooming its heart out. St Francis needs a good wash as he may have needed many times in his life on earth, with all his walking and preaching and eating and sleeping wherever he was made welcome. I have no idea what smell interested Diana so for her to sniff the azalea bush for such a long time. She does that on her walks, too, sniffs intently in one spot for an extended period. UPDATE: Below is a close-up of the flowers on the vine. It is taught that in the World-to-Come, dogs will lead in singing the praises of the Almighty. They will say to other creatures "Come! Let us prostrate ourselves and bow, let us kneel before G-d, our Maker". Throughout classical Jewish literature they are portrayed as the most insolent of animals. How could it be, he wondered, that this very same creature will merit to lead in the singing of praises to G-d in the World-to-Come? A charming commentary on dogs as portrayed in classic Jewish literature. Thanks to my friend Linda, who posted the link on Facebook. The answer to the question may be found at torah.org. Diana: I know I've lived here a long time, but do I like this person? Where is his hair? His arms are hairy, but his head.... Something seems to be missing. Enough already with more birds on the seventh day of Christmas. I wanted a picture of Diana inside with poinsettias in the background, but she was having none of it. She wanted to go outside, and there she is having her way. I must admit it's a good picture of her. Below are the poinsettias. They are artificial, but they would have made a nice Christmas scene with Diana. When I went in the room to take the picture of the flowers, Diana barked to come back in, but I didn't even try to pose her. What if you could put your life on rewind to a certain day or days and change how the days went? Yes, we've had books and movies on that very subject, which I will not name or discuss, because the post could get interesting. 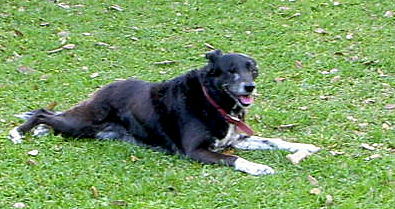 Last Saturday night, I readied myself to take my 15 year old dog, Diana, for a walk at around 10 PM. The late-night walk is not by choice but is necessary if Diana is not to wet her bed during the night. As she has grown older, she won't come to us at night to be let out if she has to pee or poo; she just does her business on the green carpet in the living room. Thus, we close her off in the part of the house which is not carpeted, which makes it impossible for her to come to us to be let out, which she won't do anyway. Washing a dog bed every day gets to be something of a chore, thus the late-night walks, which also have to be rather lengthy, because Diana does not take just one long pee but rather marks her spots all along the way. But her dog bed stays dry most nights. Diana walks on a retractable lead, which I'd left unlocked as we started the walk. The weather was cool; Diana was frisky and started off at a run around the corner of the house and dragged the back of my hand and arm across the brick post of the carport. My skin is old and thin, and the result was bloody. Grandpère took over the walking chore, while I dressed my wounds, which I'm still dressing each time I shower. The scrapes have finally stopped bleeding, but I'm keeping the wounds covered so I don't injure them again with a scrape or a bump. If I could rewind Saturday night, I would secure the lead and have Diana, as they say, on a short leash. Diana, Grandpère, and I had our 15 minutes of fame in our town. 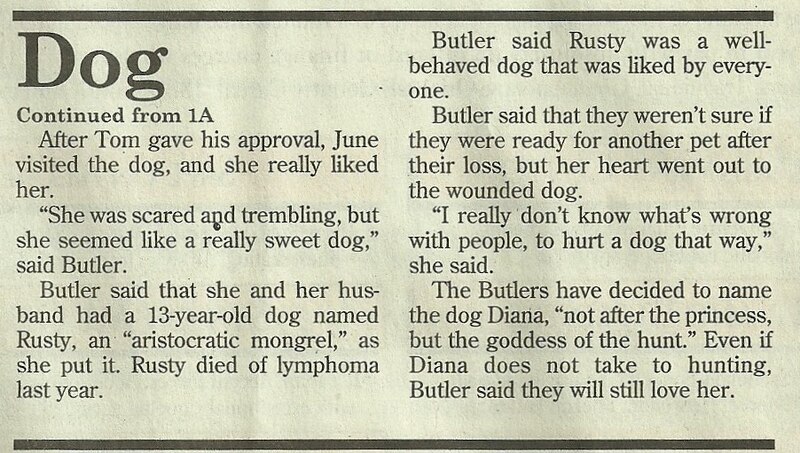 Above and below are a photo and the story in the local newspaper, The Daily Comet, of how Diana came to live with us. She was wild as I walked her out of the vet's office, jumping up and down and trying to run, and I remember thinking, "What have we got ourselves into?" As the worker at the office helped me take Diana to the car, the end of the leash caught in the bottom of the car door. The worker was going to let the lead loose, but I told him, "No! Don't let it loose; as it is she can't jump on me while I'm driving home." And that was the beginning of a 14 year relationship. And that dog don't hunt. Each time Diana was taken into the woods and let off the leash, she ended up back at Grandpère's truck, ready to go home. The woods where Tom and my sons hunt are not far from our house, and, on one occasion, Diana became impatient and made her way home on her own. As I said, we love her anyway. 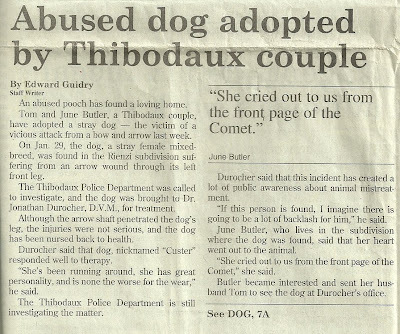 Click on the articles for the larger view. 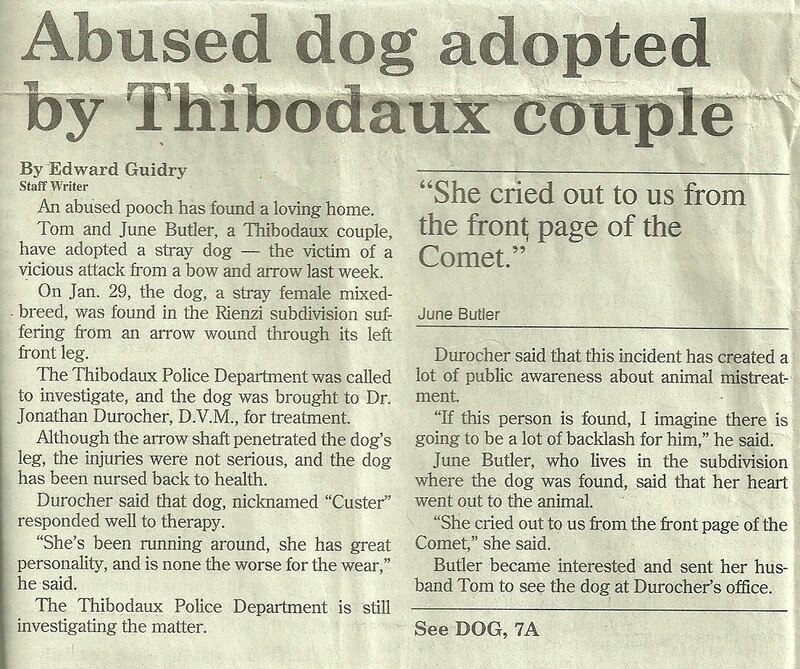 The article is dated February 6, 1998. 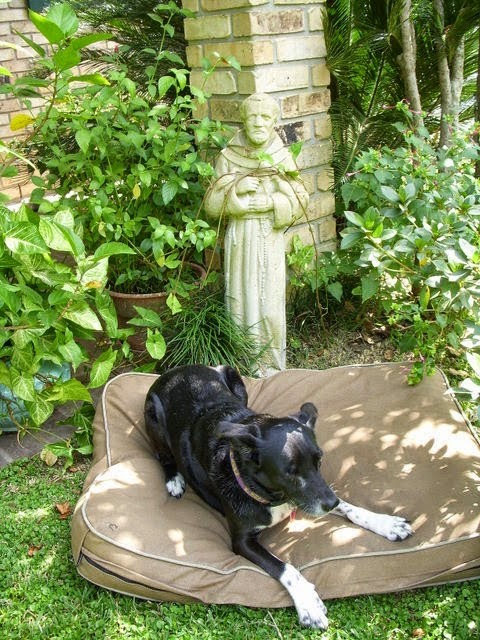 St Francis stands in the garden and watches over Diana on the lawn. Our dog needs watching because she is old, deaf, and nearly blind. For all that, when we take our daily walk, she drags me along at a fast pace, when she's not stopping to investigate the many intriguing smells in the neighborhood. Note: The azaleas are not now in bloom. The picture of St Francis was taken earlier. Diana has a new thing. She's taken to peeing on the green carpet in the living room and THEN coming to one of us to be let out. She has the order all wrong. Girl, come to be let out first, and THEN pee on the green lawn, instead of the green carpet. For three days now, we've had to clean up after her, and we'll soon have to call in the carpet cleaners. 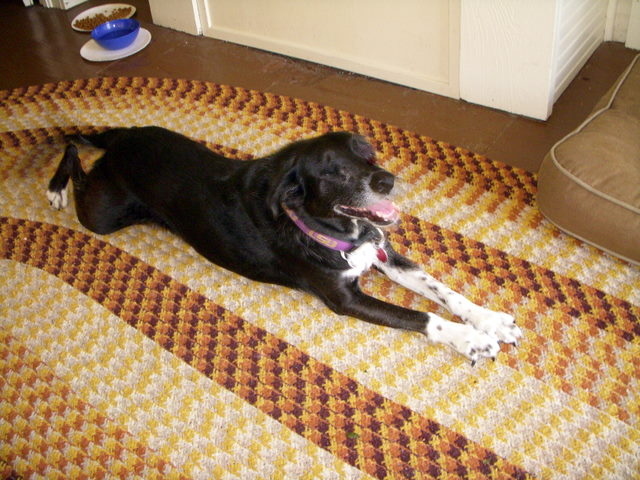 We have carpet or rugs in all the rooms except the kitchen, breakfast room, and bathrooms, and not all the areas can be closed off, except with swinging doors in the kitchen, which she can push open. Diana's age (16) and poor eyesight and hearing might have something to do with her "accidents". 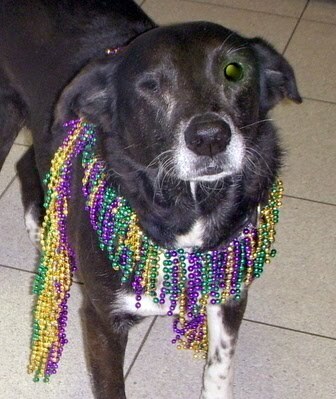 Diana dressed for the celebration in her own special beads. Pictured above is a sedate church member wearing her regular Sunday go-to-meetin' hat. Above is sedate church member's daughter dancing in the street. Diana snoozing on her L. L. Bean bed, of which she is extremely fond. These days, sleeping is the old girl's favorite 'activity'. Diana awake. She will want to go outside. If it's daylight, she will visit her favorite haunts in our large back yard. When she goes out in the dark, she will pick a spot and stand there and bark...at what we don't know. 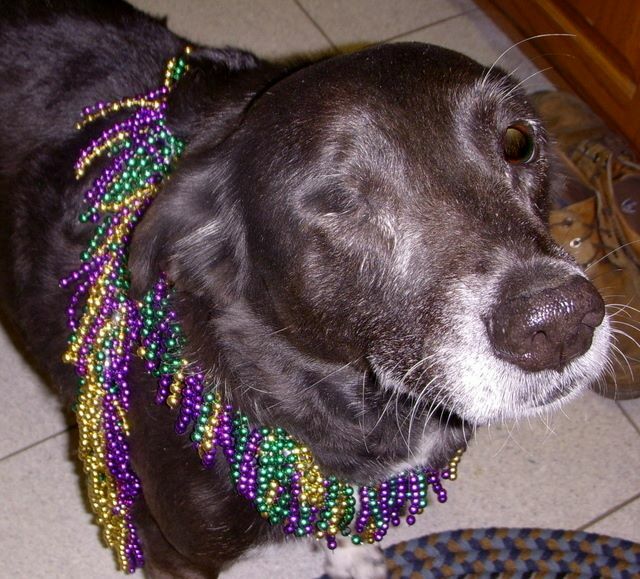 She is deaf and has only one eye with very poor vision. Above is our Diana in one of her favorite spots doing what is now one of her favorite things. See how she moves the tray under the drainpipe out of the way so she can get comfy? She's not only half blind, but she is deaf, too, so I didn't disturb her at all when I took her picture. She hears some but not much. 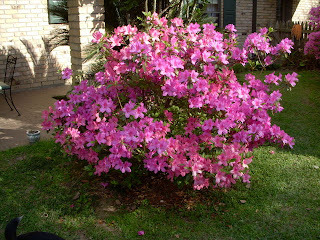 Our azaleas are at different stages of blooming, some in full bloom, some just beginning to produce buds, and some fading. 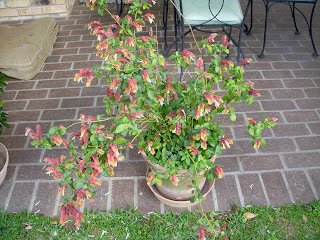 The Indian hawthorne is in full bloom, while the dwarf azaleas in the background are beginning to fade. 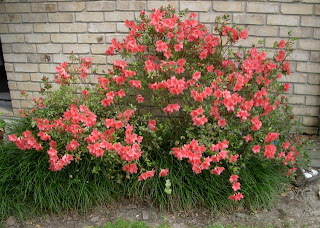 The dwarf azaleas bloom several times a year, usually with a display around Christmas, which is lovely. 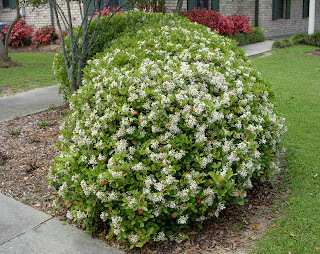 As you see, this bush is just about covered with flowers. 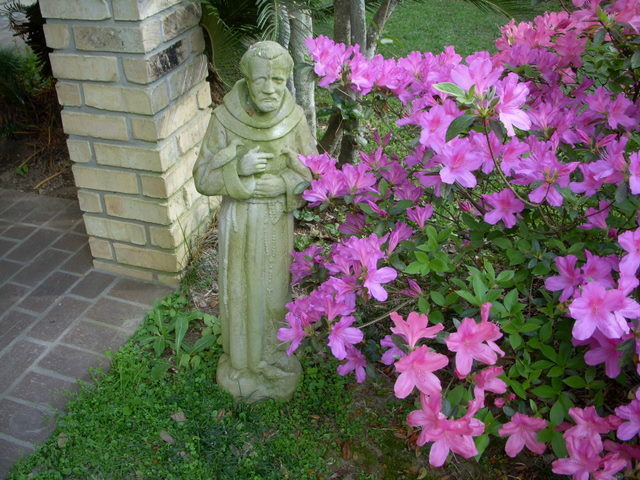 St Francis points to the lovely azalea blooms - or perhaps he points to the birdie. Who can tell? Our shrimp plant is not the greatest beauty in our garden, but the hummingbirds like to visit, so we must keep it going. Diana lolls in the yard guarding, but not eating, her dog bone. Diana, we don't want your bone. Truly. 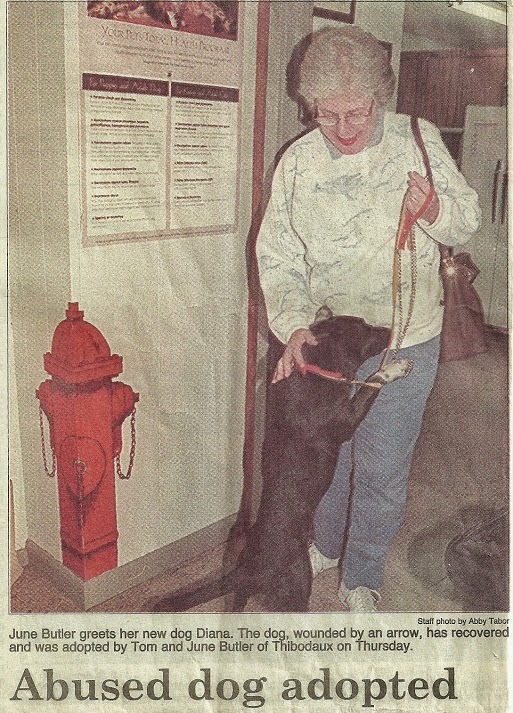 As regular readers know, Diana lost one diseased eye through an accident, but she was already nearly blind in the eye. Her remaining eye is clouded over, and she doesn't see well out of it. In addition, she suffers from arthritis and is going deaf. Poor old girl. Old age is not for sissies. 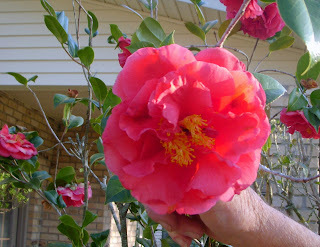 A lovely blossom from one of our camellia bushes. The wind blew strong, and Grandpère held the flower still. We think the vine is called Yellow Jessamine, but we're not sure. 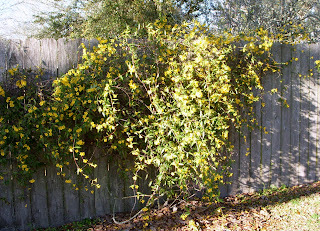 Whatever it's name, the vine grows wild, and the vine, and now the flowers, cover the bare fence boards. 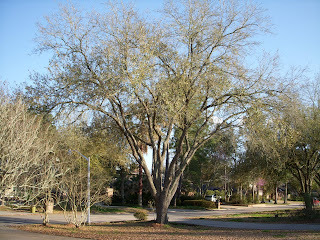 All of our oaks look bare, since many of their leaves have fallen. 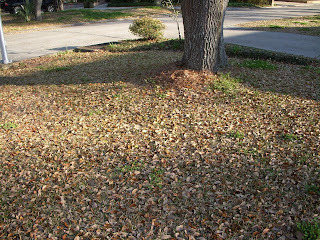 The fallen oak leaves cover the ground. 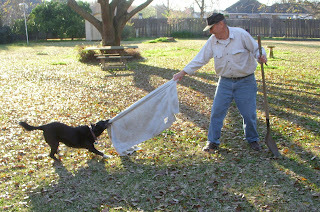 Diana and Grandpère play Diana's favorite game, pull the towel. I tried to play, but my grip is no match for Diana's toothy grip. Away the towel went with Diana quickly, without the least struggle on her part.